Running a custom crush facility can be really profitable but it comes with a host of management challenges; the personalities, winemaking protocol variances, and scheduling conflicts. It’s enough to make a reasonably organized person wonder what they’ve gotten themselves into! As most of you are aware, the reality of ‘custom crush’ is relevant to most of us operating any marginally sized facility. It makes sense to increase utilization for the capital expenditures we made for our winemaking program, by sharing those resources with others – for a fee. With the popularity of facilities offering custom crush services, the challenge has become how to compete with the operation down the road, not just on price but also value. Therefore, achieving smooth and efficient custom crush operations becomes the goal. After all, we’re either fully or partially focused on custom crush to garner some additional (diversified) revenue, so figuring out how to do it profitably is paramount. There’s also the consideration of HOW to offer custom crush via operations utilizing your bond versus “Alternating Proprietorship’s” (AP02’s), and nuances like private labels, etc. And then there’s the TTB reporting, in addition to reporting how/what each customer wants to see on a regular basis to keep tabs on their wines at your facility. Lastly, developing a fee schedule and tracking operations for billing can send your crew into a tailspin and the accounting department staging a revolt if either has to do ‘one more thing’. Fortunately, there are some software solutions available that assist with some or all of these considerations, and I’ve used most of them in one capacity or another, but keep coming back to vintrace. We’ll explore some nuances and examples below for you to test your current methods against capabilities of vintrace. For starters, it’s paramount to identify who ‘owns’ the grape/juice/wine in the first place. The simplest solution is to include the customer name as part of the lot code, e.g. 16PN-CUS-RRFR (2016 Pinot Noir, “CUS” customer, Russian River, Free Run) and this worked OK until one of my customers bought or sold wine to another of my customers. Then if I changed the lot name I tended to lose the ‘traceability’ of that lot…and inevitably that’s the lot the TTB auditor wants to know more about, but that’s another story. Unique to vintrace is an “owner” code that is separate from the lot code and in my mind is easily described as a middle layer between the lot name and which bond it belongs too. 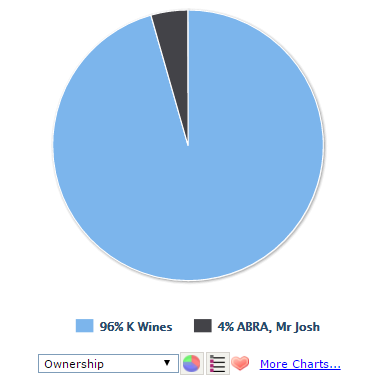 The owner is editable, has a date/time stamp for change and audit history, but here’s the cool part – vintrace can show % ownership to indicate if more than one owner owns X gallons of a particular blend in any of my tanks! And, as the owner level is a ‘layer’ in the architecture of vintrace, it’s built into the base level (read, no extra cost) and available as a sort option in a majority of the reports so I can easily include all lot info and gallons owned by any one of my customers – even if it’s shared. The owner level has two additional benefits as well; owner is a column on the TTB report breakdown so I can see how much is attributed of each owner operating under my bond making it easy for me to see periodically how much of my production is our ‘house brands’ versus custom crush. 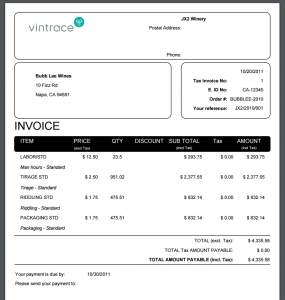 The second additional benefit is vintrace can offer ‘owner logins’ which solve a number of potential issues. Those of us that have run custom crush facilities can attest that a decent amount of time is ‘utilized’ looking up information and relaying back to a customer request…for say, latest labs, total inventory in barrel, etc. Vintrace’s owner login permits that owner to have a separate login to see a ‘light’ version of the system showing JUST their lots and reporting capabilities. I liken it to laying a piece of glass over the winery where they can see, but can’t touch/change any data. Owner logins are optional so I always recommend wineries consider how to dole them out… as it’s a double edged sword. In my experience, it’s been very helpful to significantly reduce the number of inquiries my team need to chase up and communicate back – making us more efficient. But there are those who will persistently inquire why the work they request last Friday is still pending on Sunday night, with plenty of legit scenarios including we just haven’t ‘completed’ the operation in the system for you to view. Again, since there is a minor charge for these, you can pick and choose who gets an owner login. And since vintrace easily accommodates adding AP02’s to your subscription, the owner login can apply to products under your bond AND their AP02. As mentioned in previous articles, vintrace has an amazing one step TTB reporting functionality that you simply select the bond (yours or an AP02) and period, to produce a completely filled out 5120.17 (702), along with a backup report to indicate what gallons from what lots are summed to produce the number on the 5120.17. AP02’s are just as simple to produce TTB reports for, so much so that you might consider it as a differentiator offering to the custom crush competitor down the road, or charge extra for it or the backup report in excel so they can produce their own TTB reports. Let’s discuss billing and the process of producing and tracking customer accounts. With the growth of custom crush services offered, I’ve seen a propensity to offer a simple ‘grape to glass’ price so folks aren’t nickel and dime’d, and it’s a good theory, but I’ve operated enough custom crush facilities to know that it’s usually not that simple. Winemaking protocol is just one opportunity for variance – extend maceration you say, OK, 3x daily pump overs or punch downs, cold stabilization testing included in the price, well that may be a bit much…and on it goes. The best solution I’ve seen is developing a grape to glass price varying by color, but always including an ala carte pricing schedule as well so we don’t get short changed, and so the potential for working the system is minimized, i.e. we all agree up front that you are charged price A, with item 2, 7, and 9, on an as ordered basis. Then the trick is how to make the system catch those items! Depending on your fee schedule and detail of ala carte menu, there is a time commitment to initially setup costs for associated winery actions and this process usually involves management and accounting. 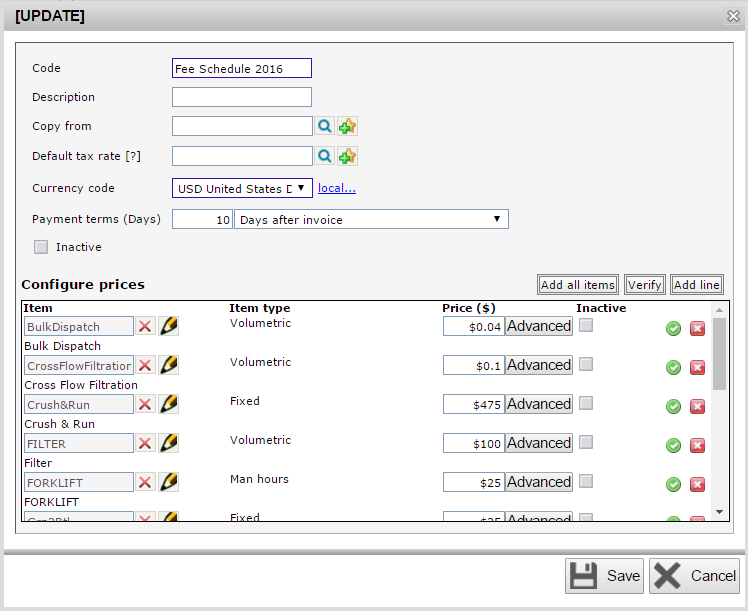 The greatest feature is the ability to copy a fee schedule and alter it accordingly for a different program, customer, vintage, etc. 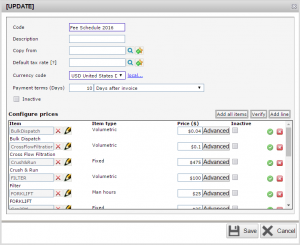 Therefore you can setup a default color fee schedule and make changes for one particular customer that only tallies fees associated with that customer! This ability is especially helpful when assessing fees post vintage so we can copy and adjust easily for the following vintage where we only want to change pricing across the board on a few items, e.g. Alcohol labs increase from $12 per to $14, etc. 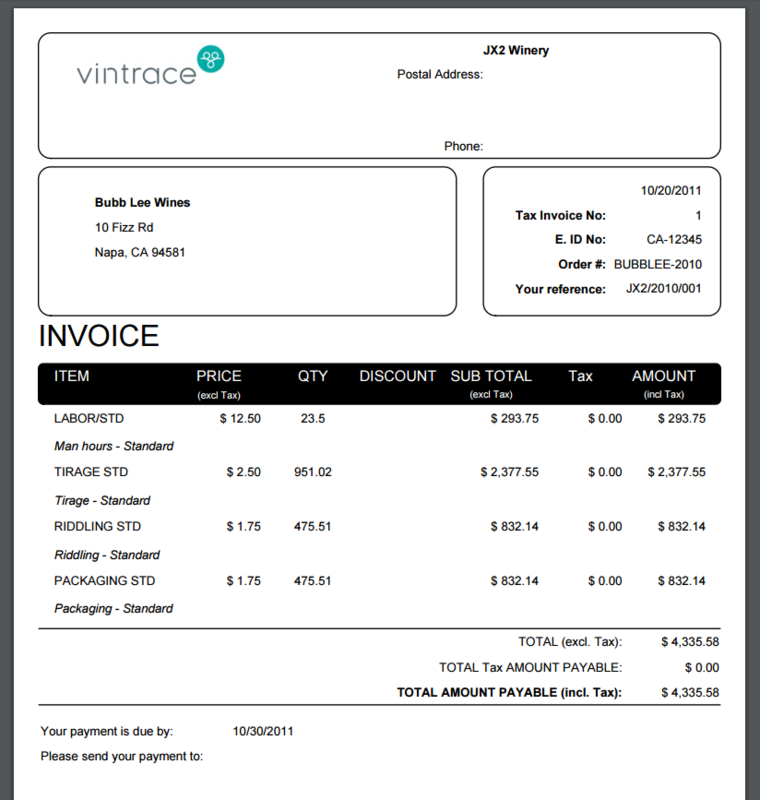 In my experience the real payoff of using vintrace’s fee schedule capability is evidenced in ‘incremental increased revenue’ from items we agreed would be outside of normal costs, and actually having those items automatically show up on the invoice, i.e. no missed legitimate revenue opportunities. Sometimes it isn’t much, but after the 3rd Alcohol ordered in one day by a customer testing blends to back into a label approval, the 3x $14 on his next bill coincides with my teams efforts and potentially staves off exploitation of resources.